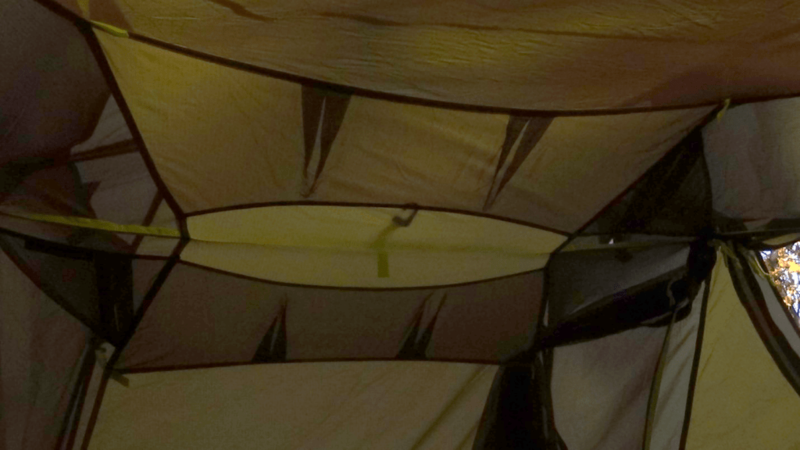 » REI Half Dome 2 Review – Does this Tent Cover the Basics? 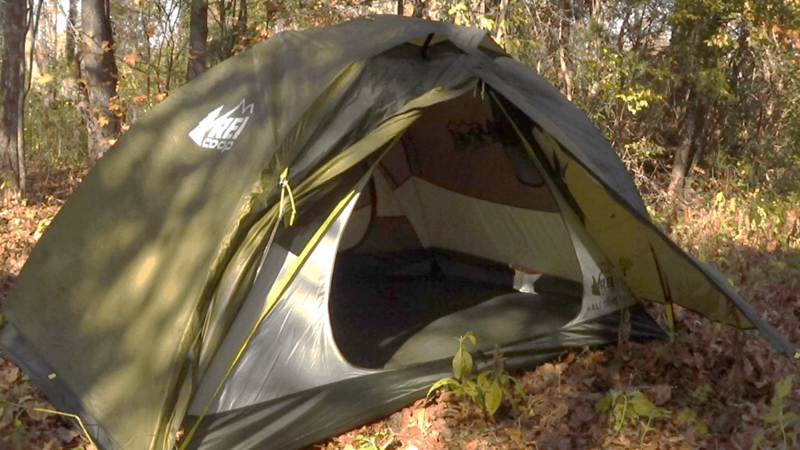 REI Half Dome 2 Review – Does this Tent Cover the Basics? These days you can get a plenty of very good hiking or backpacking equipment that cost a very pretty penny. Gear now is so advanced that it costs an arm and a leg to get the best. The silver lining is that the designs and materials of yesteryear can be had for cheap and it still has some extra than the best we had a decade ago. Especially outfitter gear, like REI’s house brand, that is driven by price point. You can get usable gear that’ll last many trips and perform admirably for a fraction the cost of brand name gear. 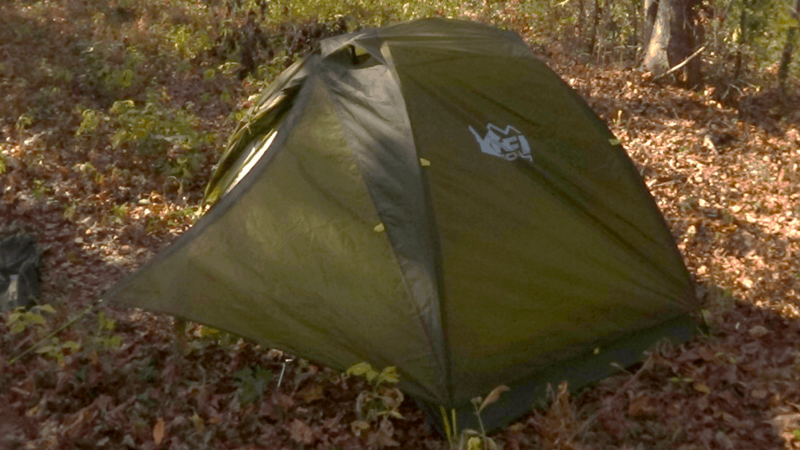 The focus of this review is proof positive of this concept, it’s one of REI tents: the awesome REI Half Dome 2. Put your boots on to get into this adventure! This is a freestanding backpacking and general backpacking tent. Sized for two people it’s a little cramped unless it’s your significant other or very close backpackers friends! The tent has two doors, two vestibules, and full-length rainfly so you won’t be worried about the water during your camping trips. It’s easy to pitch thanks to its sleeveless and hub-pole style design. The tent rolls up to a scant 6-inch by 21-inch hot dog shape. Pretty good, considering the tent floor has plenty of spacious 88-inch by 52-inch and 40-inch peak height. The double vestibule design has about 8 square feet extra on each side where you could fit a substantial sized pack. The tie outs need to be more substantial because currently, they’re awful. They’re there but they don’t work well to holdup the huge flaps of the rain fly and it can be a problem during high winds. There’s storage pockets underneath the vents inside the tent that work wonderfully. Most tent pockets are terrible but these work fantastic for small gear storage. The poles are thick enough that you can suspend a mini lantern from them without the tent caving in on itself. The tent comes with odds and ends like tent stakes and guy lines with tighteners and they’re all usable in quality and not the old school bent iron and shoe string variety. The body of the tent is made of three materials. A very small 20-denier no-see-um mesh, a 40-denier uncoated nylon and 70-denier nylon taffeta. The canopy of the body is a bit soft and the floor taffeta plays good durability. Is a nice step up from the cheap woven nylon that so many tents of this price range has. The body of the tent has no stitching problems per-se and the construction is adequate for the job it was designed for. The waterproof rain fly is a heavy duty 70-denier nylon taffeta that is stiffer than the floor and goes all the way to the bottom of the tent floor. It has vents that Velcro open and closed at the top for ventilation that can help avoid condensation and flap tie outs along each edge. The poles are the best part of the whole tent and are a heavy duty 8.7mm aluminum hub made by DAC that works amazing during a strong wind. They are thick enough that until you learn how to pull them into shape they feel a bit like they aren’t flexible enough to fit. The zippers on the tent glide smoothly and the traditional storm flap found on most gear has been done away with on everything but the rain fly. This does a wonderful job of keeping the zipper from snagging on the body of the tent. The rain fly is stiff enough and held taint by the tent stakes to keep from snagging. The plastic on the tent is heavy duty and squared away, the use of grosgrain webbing throughout instead of standard tape is a letdown but hasn’t been a problem in the time I’ve used the tent. All the seams are taped for weather protection and haven’t ever been a major problem. This is an awesome tent for where size is critical but weight isn’t. That could mean motorcycle or car camping or flying into a camping location. The tent does extremely well in these situations because it’s weather resistant and big enough without being too overly bulky. If you need a small tent this is a great option and one of the lightest. I primarily use this tent as an emergency shelter in my truck just in case I need a shelter from wind or water to keep myself dry while waiting for a tow. The design of the tent doesn’t lend itself to versatility because of its size but it does do two things that are impressive. One it can be pitched with the fly and a ground cloth, and without the tent body to save weight. It does this thanks to the hub pole design and full length rain fly. That rain fly is awesome and keeps out all the weather mother nature can throw at it. Because of its bomber rainfly you can stretch the capabilities of this tent to almost a four-season tent depending on where you live. 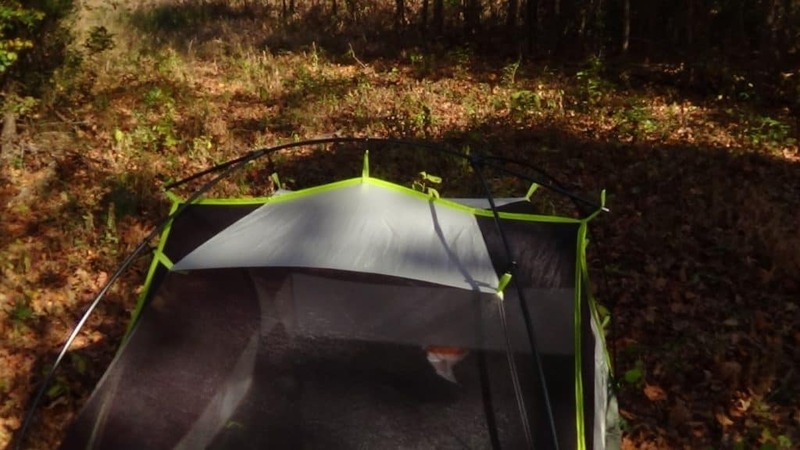 If you receive little snow and in the south, then you can use this tent year-round with a good sleeping bag no problem. I would sue the body of the tent with while doing this, but as a mild winter tent, this is a decent choice. Missing on this tent is defiantly a better way to roll up the flaps of the rain fly. There are also several places on the tent where a second-row f stitching could have been added but wasn’t. The decision to use grosgrain webbing shouldn’t have been made, I’ve simply seen too much of the stuff abraded and snap under pressure. Regular nylon climbing tape doesn’t snap or abrade nearly as easily. I’m particularly weary of the grommets that hold up the tent body, pole assembly, and rainfly tearing out one day. I appreciate the tent bag having compression loop but vinyl printed on tag is a little obnoxious once you take it home and don’t have it on a display shelf anymore. The most annoying thing about this tent is putting the poles away. The first time you try and disassemble the hub style pole it’s like trying to herd cats. My advice is to just get it in the bag, there isn’t a neat and orderly way to pack away the pole. The different sizes, curved plastic and dozen or so joints makes it a bit interesting to say the least. This needs to be fixed in a later generation, or ASAP! If you need a car camping or general camping tent for yourself and a partner, then this is a great tent for backpacking or other kinds of trips. If you want a tent for a lightest backpacking, I’d say it’s a toss up. The full-length waterproof rainfly and vents make this an awesome foul weather shelter but the nearly 5lbsof weight means that it’s a bit heavier than its counterparts. This is easy a great pick for backpackers on a budget is you don’t mind having a slightly heavier tent. The Half Dome is awesome in it’s own right it’s just lagging behind the times with the trend towards lighter and easier to carry. This tent goes more towards bomber hard and hard use gear trend that’ll last you for years. If you need a new tent for cheap I would be 100% confident in recommending the REI Half Dome 2. This is a great value option tent in its own right and will serve you well in just about anything you’re likely to use it in.